Billings Point è un tesoro nascosto privata sulla baia sud del lago Memphremagog. Questo affascinante cottage con 2 camere da letto si trova all'estremità della penisola circondata da lago e terreni agricoli. Si tratta di un ambiente tranquillo e sereno. Il casolare offre un'oasi per chi è un poeta / sognatrice o che gode di nautica e la pesca. Questo gioiello di un cottage ha un bel caminetto di pietra e un portico avvolgente che si affaccia sulle acque tranquille e la sua fauna selvatica affascinante. Le famiglie con bambini potranno godere della privacy e la vicinanza a Newport (3 mi.). The perfected place to get away from it all and unwind. Billings Point is amazing! Serene, cozy, picturesque--like going back in time, but with all the amenities anyone could want. Keith and Colin were helpful and attentive hosts--the few questions we had were answered immediately. As avid birders, we need never have left the Point to see everything from wood ducks, herons and kingfishers to mighty Bald Eagles. That said, we enjoyed visiting some of the many nearby features, like Jay Peak, Lake Willoughby, Big Falls Gorge and Eagle Point WMA. But it was always great to come back to Billings Point at the end of the day! My husband and I celebrated our anniversary at this beautiful lake cottage. The view of the lake is amazing. The screen in porch was perfect. The cottage was perfectly clean and very well equipped. Communications with Keith were immediate and easy. He took great care of us from the distance. He found out one night was going to be cold so he sent his uncle to the rescue with an extra heater for the bathroom. There are many fun things to do besides Kayaking. We went to hike Mount Pisgha and biked the Tomifobia trail to Ayer’s Cliff in Canada. We totally recommend Keith’s place! Great location. Perfect rustic getaway with a persoanl touch. What a great place to get away from it all. This little cottage down a gravel road at the end of a quiet point of land brings you back fifty years. There's another cottage nearby, but we didn't hear a peep from them after they mowed the lawn one afternoon. 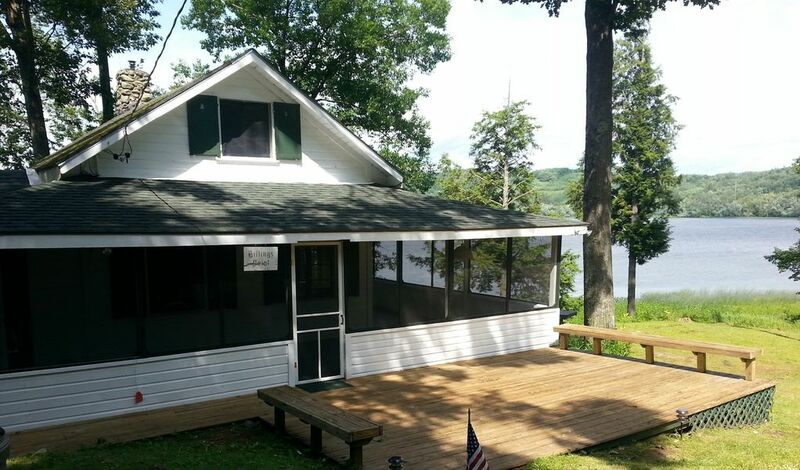 You really feel secluded sitting on the wrap-around porch watching birds fly over the lake. The cottage is perfectly clean with a modern bathroom. the galley kitchen is all you need for meals on vacation. Newer sheets and towels placed out for us were a nice touch. This place had an excellent location - right on the water. Great for fishing and birding or relaxing on the wrapped around screened in porch. Very peaceful - quiet lake and far from neighbors. The cottage was perfect. Loved the furnishings and all the nice touches from the owner. We spent a lot of time on the screened in porch - that one corner works for morning coffee, afternoon scrabble and evening relaxing. Thank you for a great vacation! Private setting, cottage was well equipped. Nice get away . We will definitely be back and would recommend this rental to other people. Thank you! Would love to have you back!